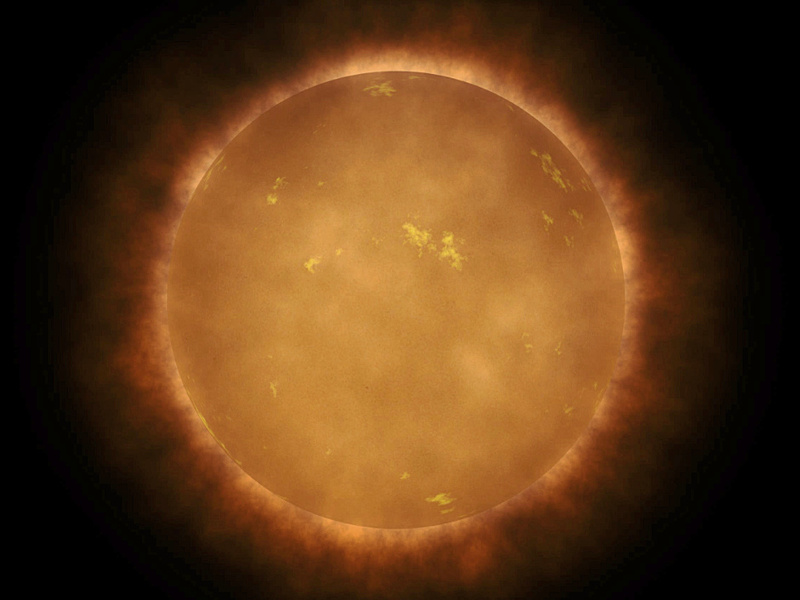 Artist’s conception of a red dwarf, the most common type of star in the Sun’s stellar neighbourhood, and in the universe. Although termed a red dwarf, the surface temperature of this star would give it an orange hue when viewed from close proximity. 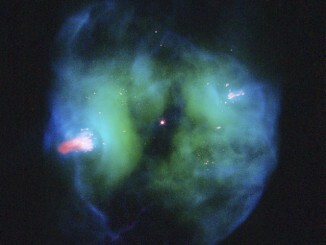 Image credit: NASA/Walt Feimer. 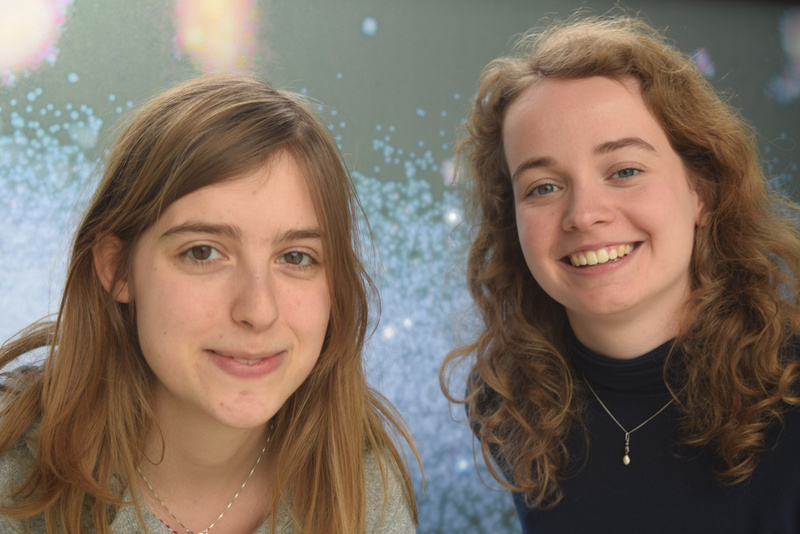 Two astronomy students from Leiden University have mapped the entire Milky Way Galaxy in dwarf stars for the first time. They show that there are a total of 58 billion dwarf stars, of which seven percent reside in the outer regions of our galaxy. This result is the most comprehensive model ever for the distribution of these stars. The findings appear in a new paper in Monthly Notices of the Royal Astronomical Society. The Milky Way, the galaxy we live in, consists of a prominent, relatively flat disc with closely spaced bright stars, and a halo, a sphere of stars with a much lower density, around it. Astronomers assume that the halo is the remnant of the first galaxies that fused together to form our galaxy. Leiden Astronomy undergraduate students Isabel van Vledder (left) and Dieuwertje van der Vlugt (right). Image credit: Jose Visser (Leiden Observatory). To find out exactly what the Milky Way looks like, astronomers have previously made maps using counts of the stars in the night sky. Leiden Astronomy students Isabel van Vledder and Dieuwertje van der Vlugt used the same technique in their research. 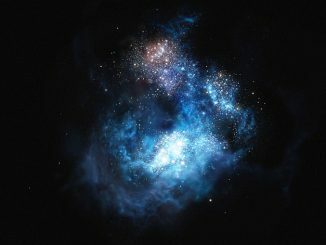 Rather than studying bright stars, the two students used Hubble Space Telescope data from 274 dwarf stars, which were serendipitously observed by the orbiting observatory while it was looking for the most distant galaxies in the early universe. The particular type of star they looked at were red dwarfs of spectral class M.
Fields observed by the Hubble Space Telescope where M-dwarf stars have been found, plotted on a map of the sky with galactic longitude and latitude. 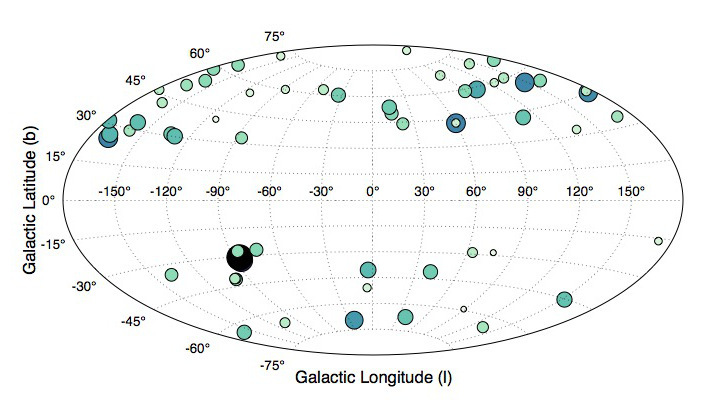 In each field, indicated by circles, only a few dwarf stars are identified. However, by combining them, the students could derive an accurate model of the Galaxy. Image credit: Leiden Observatory. The model that includes both disc and halo was the perfect match. From the positions of the 274 M dwarfs in their sample, van Vledder and van der Vlugt inferred the existence of 58 billion dwarf stars. They were also able to accurately estimate the number of dwarfs in the halo, calculating a fraction of seven percent, higher than astronomers have previously found for the whole Milky Way. The results of the students are important for future research with the European Space Agency’s Euclid Space Telescope, due for launch in 2020. Like Hubble, Euclid will image the whole sky in near-infrared. Van Vledder adds: “With our research, astronomers can now better assess whether they are dealing with a distant galaxy or a star in our own galaxy.” The students expect Euclid observations to yield an even more accurate picture of the Milky Way. Van der Vlugt and van Vledder did the research for their bachelor’s degree in astronomy at Leiden University. They worked together with Leiden astronomers Benne Holwerda, Matthew Kenworthy and Rychard Bouwens. 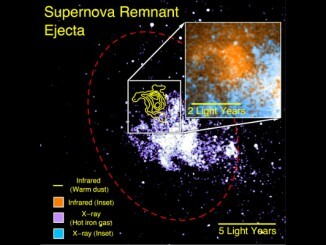 An international scientific team using NASA’s Stratospheric Observatory for Infrared Astronomy (SOFIA) has discovered a cloud produced by a supernova explosion 10,000 years ago that contains enough dust to make 7,000 Earths, showing that supernovae are capable of producing a substantial amount of the material from which planets can form.